Even those that don’t normally follow any specific sport, gets caught up in Olympic events, including both the summer and winter venues. Many of the countries from around the world consider being represented in this venue to be of great importance. Some may be more passionate about it than others, and there is little doubt that the UK is most keen on their Olympic participation. Dating all the way back to 1896, Great Britain has been represented in these games. Keeping track of the statistics from 1896 up to 2016, the British athletes have been able to bring home 847 medals from the summer Olympics. Then added to this, there are another 26 winter medals accumulated from the winter games. Out of these, 273 were gold, while there were 299 silver, and the balance was bronze. What is also impressive about Great Britain’s involvement in the Olympics is that they have had the pleasure of acting as host for the summer Olympics, not just once but for a total of three times. While throughout the years there have been many outstanding single athletes as well as teams, which is clearly depicted by the number of wins, some stand out more than others based on the total number of gold medals that they were able to bring home during their years of participation. One of the outstanding sports that has added to the Olympic medal-winning for GB is track cycling. The participants who made this possible were Sir Chris Hoy and Jason Kenny. Each of these athletes were able to pull in six gold medals a piece. When looking at the all-time Olympic greats for Great Britain, this must include Sir Bradley Wiggens, as he has earned the accolade of being the British Olympian who is the most decorated. 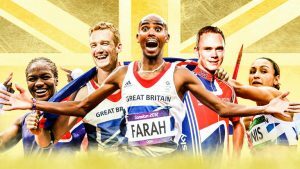 Although there is a mention of just these few, there are many more that can be added to the list of Great British Olympians.